This is a photo of a 2 bedroom "I type" apartment in Skyline. 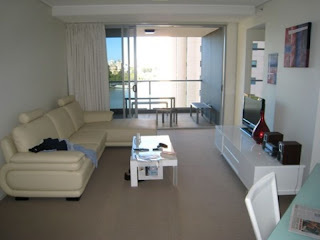 This apartment is 87 sqm internal, and was sold as having Brisbane River vistas. From the photo, you can see that it has a great view of Admiralty Towers. On the right, you can see the door to the second bedroom. It is a strange shaped apartment, with bad karma. The living room (seen in the photo) is not wide enough, and the dining area is a triangle shaped alcove. The kitchen faces a blank wall.